Staff Sgt. 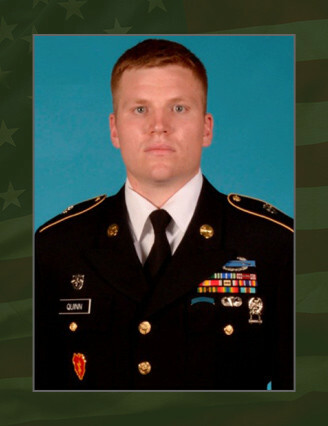 Patrick H. Quinn, 26, of Quarryville, Pa., died Oct. 13, 2013, of wounds received from small-arms fire in Paktika Province, Afghanistan. He was assigned to 3rd Battalion, 10th Special Forces Group (Airborne), Fort Carson, Colo. This was Quinn’s first deployment to Afghanistan. Quinn was born in Delaware and claimed Quarryville, Pa., as his home of record. He enlisted as an infantryman in the U.S. Army in July 2006. Upon completion of his initial training, he was assigned to 1st Battalion, 5th Infantry Regiment at Fort Wainwright, Alaska. He continued his service with 1st Battalion, 35th Armor Regiment at Fort Bliss, Texas. Quinn completed a combat deployment to Iraq from September 2008 to August 2009. After his assignment at Fort Bliss, Quinn volunteered for the Special Forces Assessment and Selection Course. He graduated from the Special Forces Qualification Course in 2013. His first assignment as a Green Beret was as an engineer sergeant with 3rd Bn., 10th SFG (A), where he served on a Special Forces team. Quinn’s military education includes the Northern Warfare Course, Combatives Level 2, Combat Life Saver Course, Warrior Leaders Course, Advanced Leaders Course, Basic Military Mountaineering School, Basic Airborne Course, and the Special Forces Qualification Course. His awards and decorations include the Army Commendation Medals (4th award), Army Achievement Medal, Meritorious Unit Commendation, Army Good Conduct Medal (2nd award), National Defense Service Medal, Iraq Campaign Medal with 2 Campaign Stars, Global War on Terrorism Service Medal, Noncommissioned Officer Professional Development Ribbon (2nd award), Army Service Ribbon, Overseas Service Ribbons (2nd award), Special Forces Tab, Parachutist Badge, and the Combat Infantryman’s Badge. Quinn was posthumously awarded the Purple Heart, Bronze Star Medal, Afghanistan Campaign Medal with Campaign Star, and the NATO Medal. He is survived by his wife and their three sons.